Lies Between Us by Ronnie Turner #review @HQdigitalUK @ronnie_turner #WhereIsBonnie? It was with great excitement that the blogging community heard a while back now that one of our own, Ronnie Turner, had secured a publishing contract. It is a measure of that excitement that there is a mega blogtour to celebrate publication of the book. But I’m sure that she is on tenterhooks as she knows that virtual friends or not, she will get nothing but honest reviews from her fellow bloggers because that’s what we do! My goodness, Ronnie Turner has a dark mind! I have to admit that I found the story a little confusing to begin with, with the three separate storylines taking place at three different time periods. But if you feel the same, I’d say stick with it as once I had my head around who was who, each different part was equally absorbing. We read about Miller, who has to be one of the nastiest characters I’ve ever read about. He is a seriously disturbed child with a devious mind who seems to take great delight in hurting people. We hear his story in what is almost a diary format over many years, giving a real insight into his thoughts. Then there is John and his pregnant wife Jules whose daughter Bonnie has disappeared and they are having to cope with terrifying photographs and messages from whoever has taken her. And finally, there is Maisie, an ICU nurse caring for Tim who is in a coma following a violent attack. As she supports his wife, Heidi, she suspects that Heidi has something to hide. 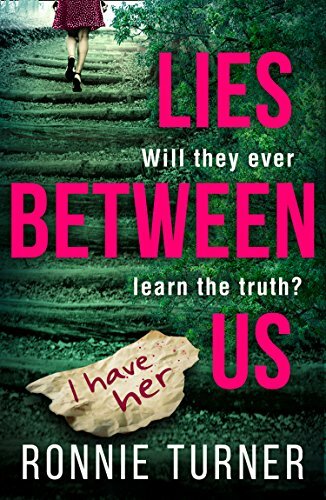 Lies Between Us was a lot darker than I normally read but I did find it was a very compelling read. It was creepy and very intense and although some parts were uncomfortable to read, especially about what was happening to the missing child Bonnie, I had to read on to find out what exactly was going on and how the three stories would connect. The book is very cleverly plotted. I genuinely had no idea for a long time what the connection between the stories would be. I gradually began to guess the connection between Miller and John’s stories but was cunningly misled by the author and definitely did not guess what was coming. And I had no idea where Maisie’s part fitted in until the very end. In every part of the story there were characters who had secrets to hide and who it seemed couldn’t be trusted. Who exactly was telling the lies and what were all these lies? Lies Between Us is a real page turner. Thanks to the publishers HQ Digital for asking me to take part in the tour and for my copy of the book. Lies Between Us is available now as an ebook and the paperback will follow in December. This is poster 2 of 4 so check out Ronnie’s Twitter each day for the up to date blog stop.